Grizzly Bear sitting with Ice... / p.o.s. This Grizzly Bear sitting with Ice-cream Cone is a fantastic new Ice-cream point-of-sale model, ideal to attract customers, especially children, to your Ice-cream shop or stall. This charming Grizzly Bear is sitting holding a Ice-cream in a waffle cone. A great point of sale model for your window or counter top display. 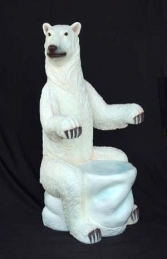 This model would look good with the Polar Bear sitting with Ice Cream (JR 2726).